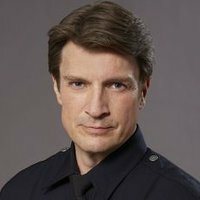 Nathan Fillion (born March 27, 1971) is a Canadian actor best known for his role as Richard Castle on the ABC series Castle as well as his earlier portrayal of the lead role of Captain Malcolm Reynolds in the television series Firefly and its feature film continuation, Serenity. He has acted in traditionally distributed films like Slither and Trucker, Internet-distributed films like Dr. Horrible's Sing-Along Blog, voice acted in video games Halo 3: ODST and Halo: Reach, television soap operas and sitcoms, and in theatre. 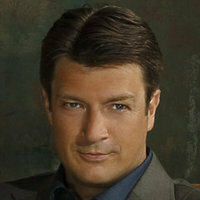 Fillion was born in Edmonton, Alberta, Canada, the younger son of Cookie and Bob Fillion, both of whom are retired English teachers. He has an older brother, Jeff, and attended Holy Trinity Catholic High School, Concordia University College of Alberta, and the University of Alberta, where he was a member of the Kappa Alpha Society. According to Fillion, he is descended from Confederate Lieutenant General Jubal Anderson Early. 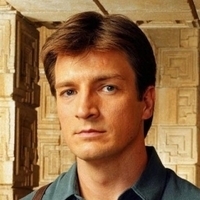 Fillion gained critical acclaim and a large cult of fans when he starred as Captain Malcolm Reynolds on the 'Joss Whedon' TV series Firefly (2002), having previously been a regular on One Life to Live (1968) and Two Guys, a Girl and a Pizza Place (1998). Fillion had also appeared in small roles in the films Blast from the Past (1999) and Saving Private Ryan (1998). 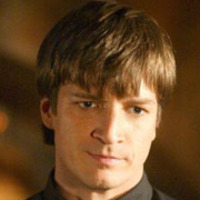 Whedon gave Fillion a chance to display his range when he cast Fillion as the twisted preacher Caleb, a villain, in the seventh and final season of Buffy the Vampire Slayer (1997). When Firefly (2002) was prematurely canceled in late 2002, the show's cast, crew, and many fans were devastated. Whedon vowed to resurrect the series in some way, and Fillion played Captain Reynolds again in the feature-film Serenity (2005). Fillion followed this film with more big screen leading roles in the horror-comedy Slither (2006) and the indie hit Waitress (2007). Fillion co-founded the non-profit organization Kids Need to Read with author 'PJ Haarsma' in 2007 to inspire kids' imaginations by getting more books into underfunded libraries. He also continued to be a force in television, starring in the short-lived Fox-TV series Drive (2007) and appearing on ABC's Desperate Housewives (2004). He took his first singing part (and cemented his cult appeal) as Captain Hammer in Whedon's musical Internet smash Dr. Horrible's Sing-Along Blog (2008). 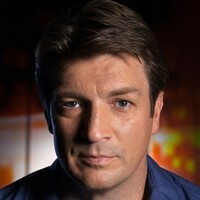 In late September 2011, Fillion guest starred as the Action Sports 1 anchor in the web series Husbands. He played Dogberry in the independent film Much Ado About Nothing (2012), based on the Shakespeare play of the same name, written and produced by Joss Whedon. In 2012, he appeared in the episode "The Daly Superheroes" of the web series The Daly Show. On February 17, 2013, Fillion hosted the 2013 WGA West Coast Awards. Claims to be descended from Confederate Lieutenant General Jubal A. Early. When told this, Joss Whedon created a bounty hunter by the name of Jubal Early for the Firefly episode "Objects in Space.". 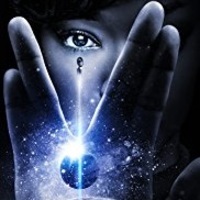 When he won best actor at the 2006 SyFy Genre Awards for his portrayal of Captain Malcolm Reynolds in _"Firefly" (2002)_ (qv), the show had been off the air for around 3 years. Attended Concordia University College of Alberta and the University of Alberta. Wanted to be a high school Drama teacher. In college he majored in art, and minored in drama while pursuing an acting career on the side. Parents are Cookie and Bob Fillion, both of whom are retired English teachers. Has an older brother, Jeff. Auditioned for the role of Michael in Dawn of the Dead (2004). He considers his time on _"Firefly" (2002)_ (qv) to be the most fun he had on a TV series.